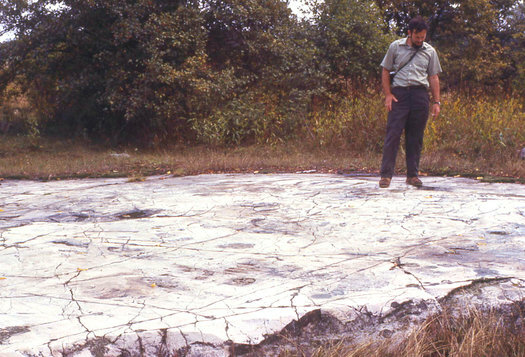 Potsdam Sandstone is the oldest sedimentary rock in the region, the bottom-most layers that cover the crystalline rocks of New York State and southern Ontario. It was named in 1838 by Ebenezer Emmons for exposures along the Raquette River south of Potsdam. Emmons, a Massachusetts college professor, was hired by the newly-organized Geological Survey of New York to examine the natural resources of the state’s northern district. The sandstone ranges in thickness from tens of feet in the St. Lawrence Valley to hundreds of feet in the Lake Champlain Valley. It was deposited when a Cambrian sea crept onto the continent and flooded a land surface of low hills and ridges on ancient crystalline rocks. Profound erosion throughout later geological periods has returned the land nearly to the level of that erosion surface, whose presence is indicated by an unconformity at the base of the stratigraphic column (Figs. 2, 3). 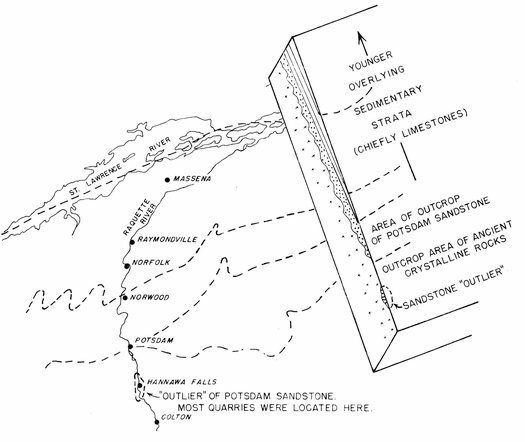 Potsdam Village is located at the boundary between Adirondack crystalline rocks to the south and the sedimentary strata that underlie most of the St. Lawrence Valley (Fig. 4). Sandstone and limestone of progressively younger age crop out in east-west belts across the valley (Fig. 5), and the Raquette River crosses each belt in its northward journey. The river first encounters the Potsdam Sandstone near Hannawa Falls, but returns to the crystalline bedrock at Fall Island in Potsdam. Little is seen of the overlying Theresa Formation north of Potsdam, but from Norfolk to Massena and beyond, the river is entrenched within limestone and dolomite of the Beekmantown Group. One can see the influence of bedrock in the distribution of stone buildings—red sandstone structures at Potsdam give way northwardly to buildings of dark carbonate rock, especially the “Ogdensburg dolomite” in the Beekmantown Group that crops out near the St. Lawrence River. Examples of buildings made of dark dolomite stone include the Custom House at Ogdensburg (1809-10) and St. Paul’s Episcopal Church at Waddington (1818), the oldest stone church in the North Country. One sees little bedrock in the fields and woods away from the river. It is buried under sheets and low hills of rock debris left during the glacial epoch that ended more than 12,000 years ago. Figure 2. 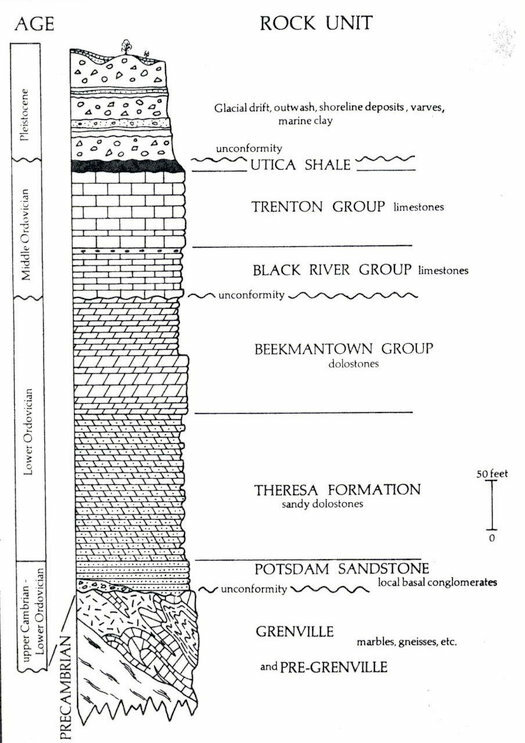 Stratigraphic column for the St. Lawrence Valley. The Potsdam Sandstone overlies an ancient erosion surface, now seen as an unconformity between Cambrian and Precambrian rocks at the base of the column. The sandstone is of Late Cambrian age (ca. 520 million years old), whereas the age of underlying crystalline rocks varies from nearly 1000 million to more than 1300 million years (1 to 1.3 billion years). Limestone of the Theresa Formation and Beekmantown Group overlies the sandstone. These Lower Ordovician rocks are exposed north and west of Potsdam Village and along the St. Lawrence River. Much bedrock is covered by glacial-depositional sediments, as is shown at the top of the column. On Clarkson Hill (today’s Clarkson University campus) and elsewhere in the Potsdam area, the glacial sediments directly overlie the crystalline rocks and sandstone. Reproduced from B. VanDiver, 1976. Figure 3. 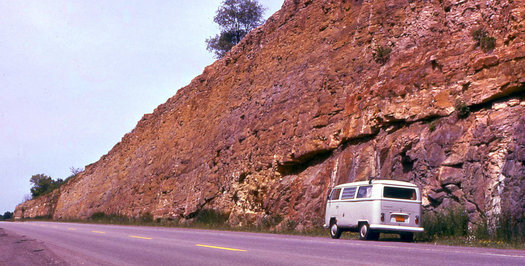 An unconformity at the base of the Potsdam Sandstone occurs at the dark band—the shadow cast by protruding sandstone slabs above the 1968 Volkswagen bus. Below the shadow is the outline of a low hill of ancient crystalline rocks. The hill was submerged by the Cambrian sea, and Potsdam Sandstone was deposited over it. Route 12 near Alexandria Bay in the Thousand Islands. Photo in 1972. Figure 4. 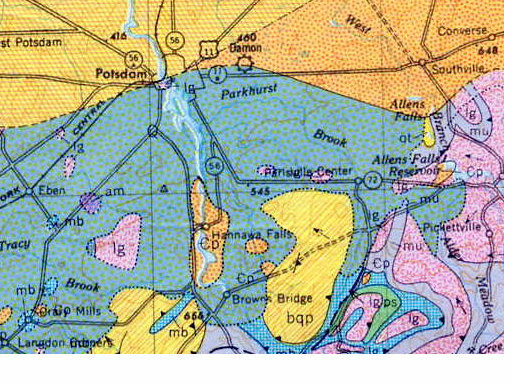 Geologic map of the Potsdam area. The village is located at the boundary between ancient crystalline rocks to the south (darker shading) and younger sedimentary strata of the Potsdam and Theresa formations to the north. In the upper right is the belt of Potsdam Sandstone. Most quarries were established along the Raquette River near Hannawa Falls in a sandstone outlier (see arrow) surrounded by crystalline rock. Reproduced from Y. Isachsen and D. Fisher, 1970. Figure 5. Block diagram of north-dipping Paleozoic strata in the St. Lawrence River Valley. Beginning at Blue Mountain Lake, the Raquette River flows over crystalline rocks in its northward journey into the St. Lawrence Valley. Here it crosses successively younger layers of Paleozoic strata before joining the St. Lawrence River near Massena. Note the “outlier” of Potsdam Sandstone near Hannawa Falls where the Clarkson and Parmeter quarries were located. The transition from one belt of strata to another is not accompanied by a change in topography. There are no east-west escarpments in the St. Lawrence Valley to mark the change in strata, in spite of the fact that Potsdam Sandstone is much harder than limestones in the overlying Theresa Formation and Beekmantown Group. Erosion has been prolonged, even-handed and thorough, and most topographic expression in the valley is glacial-depositional in origin. The exception, of course, is the rugged terrain to the south; one must drive uphill to view the crystalline rocks in the mountainous core of the Adirondack Dome. Remnants of Potsdam sandstone are exposed from Gouverneur Village northward to the Thousand Islands. Sandstone makes up the cap rock of low buttes, as well as the bedrock floor underlying the soils of certain fields and pastureland. 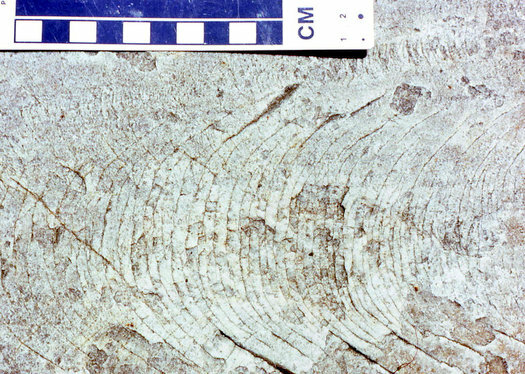 Glacial striations and chattermarks are common (Figs. 6, 7). Farmers with acres of shallow-soil, bedrock-floored fields had to build snake-like fences that did not require the digging of post holes (Fig. 8). Figure 6. A bedrock surface of jointed, gray Potsdam Sandstone that displays glacial striations near Brasie Corners, N.Y. The geologist is John Cecil of Jefferson Community College at Watertown. Photographed in September, 1970. Figure 7. A band of crescent-shaped fractures called “chatter marks” on gray Potsdam sandstone. A rock fragment the size of a cobble was tightly held at the bottom of a glacier. It evidently moved and chipped the bedrock during glacial flow. Most likely, the glacier moved from right to left in forward jerks rather than by smooth and steady flow. Figure 8. A zig-zag or snake fence laid across a field floored by sandstone or limestone bedrock. The presence of hard rock beneath the shallow soil did not encourage the digging of fence posts. 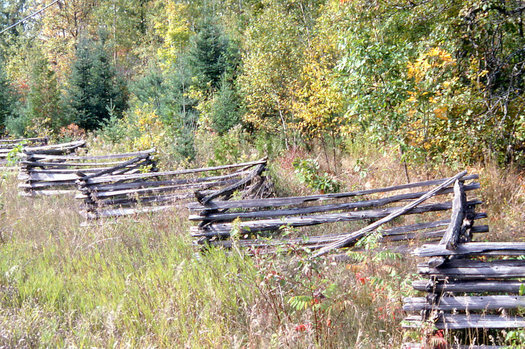 Boulders removed from the field were placed beneath such fences, forming mounds of rock when the split cedar rails had rotted away.